Golf is a very old game of which the exact origins are unclear. The earliest origin of golf is open to debate, with good evidence that it could be Chinese, Dutch or Scottish. However, the most accepted golf history theory is that the sport of Golf, as we know it, originated in Scotland in the 13th century. 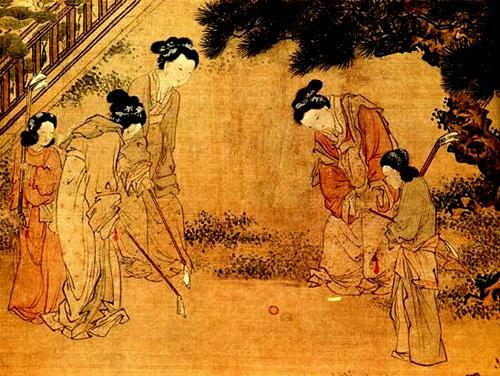 A game somewhat similar to golf called chuiwan was first mentioned in Dongxuan Records, a Chinese book of the 11th century. It was played with balls and sticks that looked like short golf clubs. The goal was to strike the balls into the goals which were small pits in the ground. Unfortunately it died out during the Ming dynasty and probably never made its way to the West. Hurley, a form of field hockey, was played in Ireland and other Celtic areas from prehistoric times. Two teams would fight to move a ball across a large field into a home goal by hitting it with clubs. 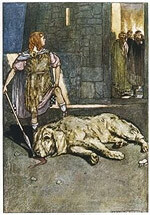 In theThe Cattle Raid of Cooley, a 2000-year-old Irish epic poem, a young CuChulainn killed Cooley's hound—a giant, vicious guard dog—by driving a wooden ball into the open mouth of the hound with his hurley stick. In another story he won a hurley game against a whole school of young warriors all by himself. Another popular 13th century game, football, was played by two teams of any number of players in the open fields between towns. There were no rules, just get the ball into a barrel in the center of in the opposing team's town. Needless to say it lead to many injuries. Hurley was played by similar rules but with a smaller ball and clubs that looked like shortened hockey sticks. Sometime before the 13th century, hurley was replaced by a less dangerous game called Koff that was also played across the countryside between villages with clubs. Instead of fighting against another team as in football, the players competed against each other to reach the goal (which was usually a bucket placed in front of a pub) in the lowest number of strokes. Koff spread to the contenient quickly. You can imagine the excitement this mad footrace caused as competitors swarmed over the countryside, splashing through marshes, climbing hills, leaping fences, swinging clubs at the balls and each other, yelling and screeming all the way. Another more elegant game called chole was mentioned in a letter written on February 26, 1297, in the Flemish city of Loenen aan de Vecht where they played a game with a stick and leather ball. The object was to strike the ball into a target area more times than the other players. It wasn't until later that this "driving range" kind of game really became golf with the addition of a dedicated course. Another theory is that golf evolved from croquet, however, it is much more likely that it is the other way around. Croquet was unknown in most of Britain before the 19th century. Toy maker, John Jaques II, saw commercial potential in a children's game played in Ireland and introduced it to England at the great Exhibition of 1851. It caught on like wildfire and became the most popular outdoor game in the empire within 10 years making him a very wealthy man. He published a book of rules in 1864 that still governs the game to this day. criyt done and nocht vsyt—1457. & golf be abusit in tym cummyng—1471. Erle of Bothuile & Franch crounis—1504. be halted in the time comming—1471. of Bothwell and the French crowns—1504. Modern golf, played on a golf course, has well-documented Scottish origins. Hugh Kennedy, Robert Stewart and John Smale, three of the earliest identified players, are credited with combining two Flemish games and marrying it to the natual landscape of Scotland. While their regiment was fighting with the French against the English at the Siege of Bauge the Scotsmen learned to play chole and koff from the locals. Upon returning to Scotland, they invented a mixed up version of the games that they could play on the wasteland, or "links" as it was called, between the land and sea that was only good for grazing sheep. This landscape with its water hazards, sand traps, bunkers, sheep shorn fairways, and rough edges became the model for all golf courses that followed. The first game of golf for which records survive was played at Bruntsfield Links in Edinburgh, Scotland, in 1456, and is recorded in the archives of the Edinburgh Burgess Golfing Society, now The Royal Burgess Golfing Society. In 1457, King James II of Scotland banned the game on Sundays because it was distracting his subjects from practicing archery, and developing the military skills needed for war with England. The ban was lifted in 1502 after the signing of the Treaty of Glasgow. In 1553, The Archbishop of St Andrews issued a decree giving the local populace the right to play golf on the "links" (the area linking the land to the sea) at St. Andrews. Queen Catherine of England wrote about the growing popularity of golf in England in a letter to Cardinal Woolsey in 1513. Mary, Queen of Scots, reputedly played golf in 1567 shortly after the death of her husband, Lord Darnley. That makes her the first recorded female golfer and proves women were involved from the beginning. ocean became the template for all future golf courses. Golf courses have not always had eighteen holes. The St. Andrews Links occupy a narrow strip of land along the sea. As early as the 15th century, golfers at St. Andrews, in Fife, established a customary route through the undulating terrain, playing to holes whose locations were dictated by topography. The course that emerged featured eleven holes laid out end to end from the clubhouse to the far end of the property. One played the holes out, turned around, and played the holes in, for a total of 22 holes. In 1764, several of the holes were deemed too short, and were therefore combined. The number was thereby reduced from 11 to nine, so that a complete "round" of golf comprised 18 holes. Elm balls imported from the Netherlands were used until 1618, when the featherie ball was invented. This added a new and exciting feature to the game of golf. A featherie is a hand sewn leather pouch stuffed with goose feathers and coated with paint. The feathers in the ball were enough to fill a top hat. They were boiled and put in the cowhide bag. As it cooled, the feathers would expand and the hide would shrink, making a compact ball. A featherie could travel more than twice the distance of an elm ball. Due to its superior flight characteristics, the featherie remained the standard ball for more than two centuries. However, an experienced ball maker could only make about four in one day, so they were expensive. A single ball would cost between 2 and 5 shillings, which is the equivalent of $150 and $400 today. Also, it was hard to make a perfectly spherical ball, and because of that, the ball often flew irregularly. When playing in wet weather, the stiches in the ball would rot, and the ball would split open after hitting a hard surface. Golf clubs were fashion from a single piece of ash wood and had the shape of modern golf clubs, though the heads were a little more elongated. The players used only one club for all shots. This meant that the players needed to kneel to putt. In this 16th century painting by Simon Bening, one of the players is pointing to the clubhouse where others are already having a drink. Its amazing how little the best parts of the game have changed in all these years! If you want to add this article to your list of favorites or email it to a friend, please use this permanent URL, https://stores.renstore.com/-strse-template/0806B/Page.bok. Permission is granted by the author to quote from this page or use it in handouts as long as you include a link back to Renstore.com.